Stosh is a member of the Britnerf community and is a fantastic guy. We have spoken a lot on the forum but I met him for the first time at the Britnerf Annual General War (BAGW) earlier in September. 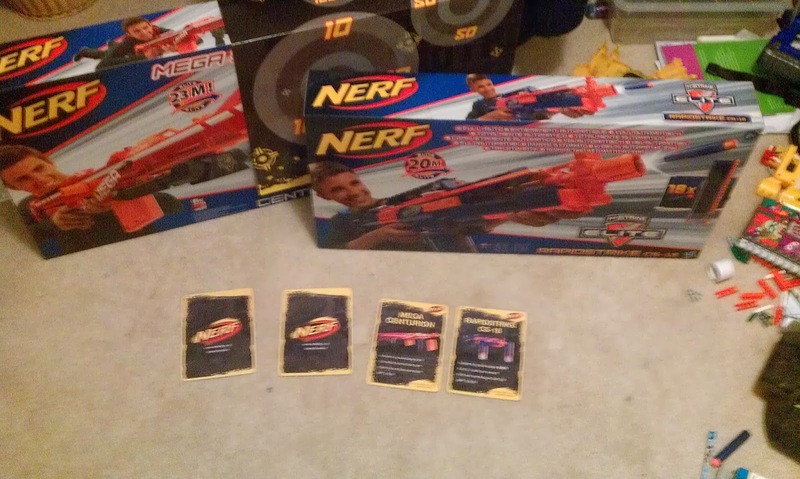 Below is Blame_Stosh's account of Hasbro's MEGA Centurion release party. 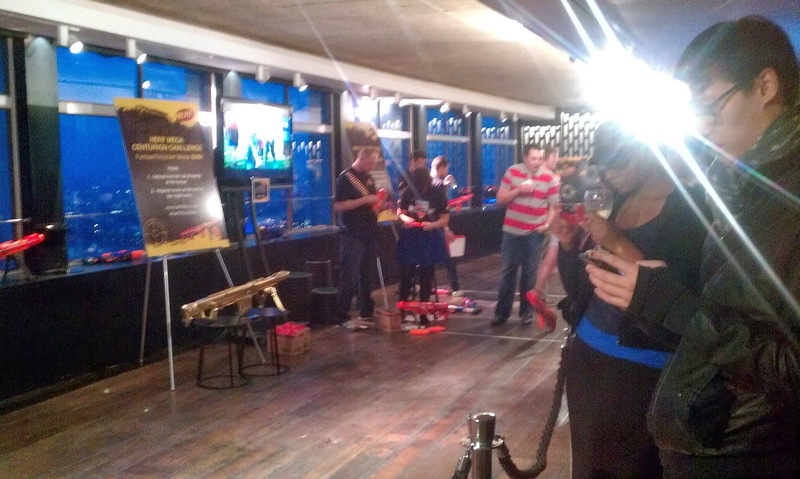 "On Monday 30th September 2013, I attended MEGA Centurion release party hosted by Hasbro. The party was billed as being host to "The Ultimate Office War" which, to be honest, was a pretty steep claim. 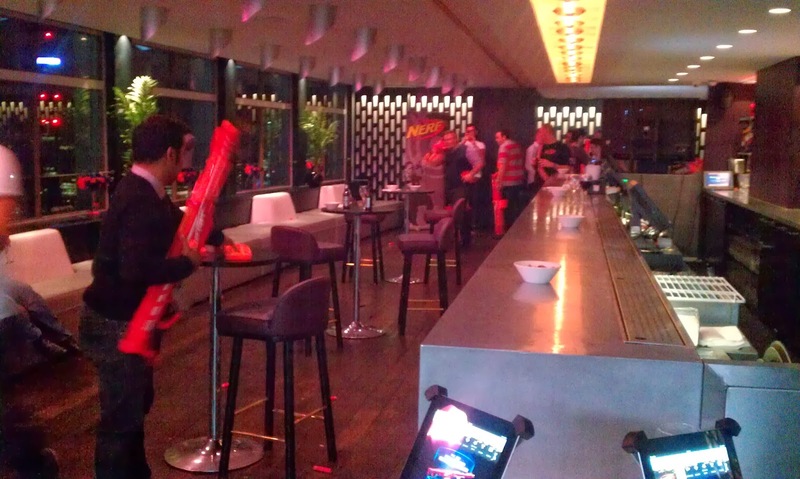 The event was held on the 31st floor of the Paramount restaraunt at Centerpoint in central London. Although it was billed as an office war, it was mainly a shooting range, but more on that later. The atmosphere was more relaxed than I was expecting. It felt like more of a social event and people were discussing news and other important matters other than NERF, they were journalists after all! 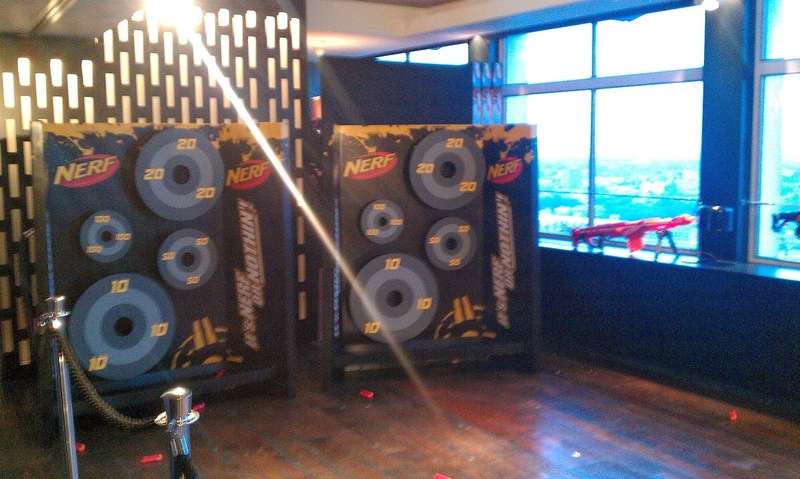 We started off the event with two shooting ranges, one for the new MEGA Centurion and one for the Rapidstrike CS-18. Scores were taken and at the end of the night, the people with the highest target score won the prestigious 'Golden Blasters'. 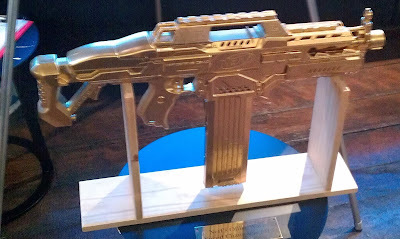 In reality, they were just a Rapidstrike and a Centurion spray painted gold, with one or two pieces vacuum metallised in gold chrome. On to the blasters. The Rapidstrike is good fun, quite accurate at medium range and has a ridiculous rate of fire. The ROF is this blasters party piece and is the main selling point of this blaster. 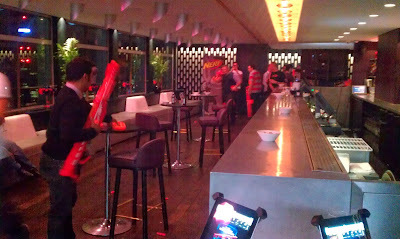 Some of the PR guys have been quite proudly making the claim that it is "the fastest firing NERF blaster ever". Obviously they haven't played with a Magstrike or an RF-20 for a while (if at all)! The Centurion on the other hand, is horribly inaccurate and has a stupidly long prime. The sheer size of it is an issue as well. By now you've all read the reviews of it and formed your own opinions but for me, this thing is just way too long. I can confirm that the ranges of the European version are not that different from that of the Elite blasters. This is really disappointing. Hasbro were billing it as 'the farthest firing NERF blaster ever', I would be inclined to add the suffix '... but only just'. It seems a shame that the main selling point of this blaster has to be altered in this way but I'm sure that Hasbro are just as miffed about it as we are! 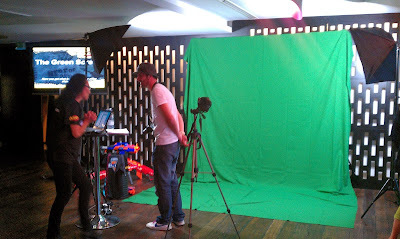 There was also a green screen at the event. This gave everyone the opportunity to take photos holding the blasters against different back drops. It was kinda gimmicky but a lot of people had fun with it. I didn't go for it. There were some questions that needed to be asked! I managed to talk with one of the brand managers for NERF. I asked him several questions about where the themes and lines are heading, what we can expect to see in the future and so on. Obviously he couldn't divulge too much but I did manage to get the following answers. He said that Hasbro is focusing on N-Strike Elite in the UK because the risk potential bringing Zombiestrike and other lines into the country is too big. NERF is not as well established in the UK as it is abroad and shelf space in British stores is simply too small to support a wider product range. He said that we may see Zombiestrike in the UK next year, but we shouldn't count on it. He said that they were expanding on the N-Strike Elite and MEGA lines, and one more thing we should be excited about! No clues as to what this is. Could there be another new range coming from NERF? We also have some VERY good news! Hasbro have heard our request for attachments and are now looking into it! This could be partly due to the petition started by Bay Area Nerf and the ensuing pressure added when the NIC spammed the NERF Facebook page but we can't say for sure. All we know is that Hasbro has listened and are looking into it. He said that we did not originally get all of the N-Strike Elite releases because of shelf space issues. This meant a decision had to be made about which products to release here in the UK. This explains why we didn't get the Triad although, now ASDA carry it as an exclusive. The idea for the MEGA line was that people wanted more range. In response Hasbro created a set of blasters specifically suited to this task but don't deviate too much from original N-Strike but build on them instead. 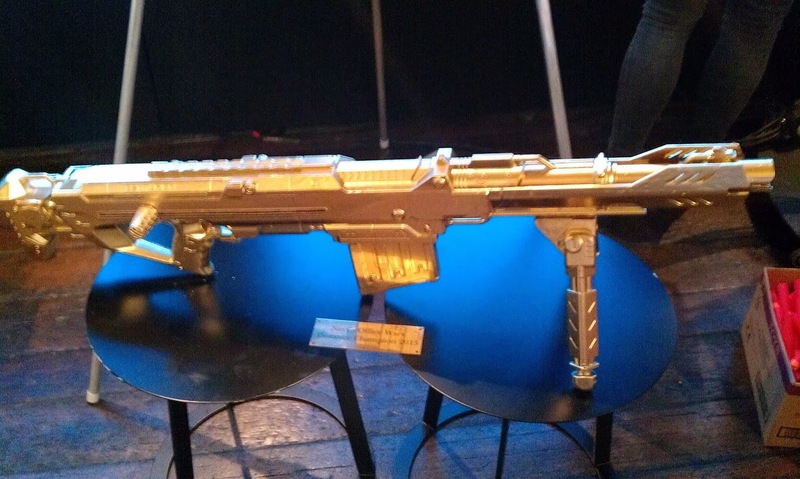 Oh, and the Mega Javelin we all heard about? Codename for the Centurion. The Majority of the guests there were PR and media, journalists and bloggers. The aim of this 'launch' was to create a lot of media attention in the run up to Christmas. Although it was intended for the event to be a shooting range only, it quickly spiraled into the hectic office war, as it was billed to be. Let's face it. This was always going to happen! The Rapidstrikes were zip-tied to the walls, so it was a battle of the Centurions, and I have got to tell you, when shot in the face, they sting! 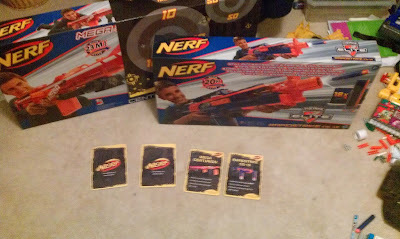 At the end of the evening, everybody was given a goodie bag which not only contained both the Rapidstrike CS-18 and MEGA Centurion NERF 'Top Trumps' cards, but the blasters themselves! All in all it was a fantastic evening and I learned a lot. It was great to be invited and I would like to thank UkNerfWar and the UK Nerf team for kindly inviting me to cover the event for them. Thanks guys." I would like to thank Blame_Stosh for attending this event in my stead. He made himself availabe at short notice and came back with the goods. Thanks Stosh for being awesome one again.